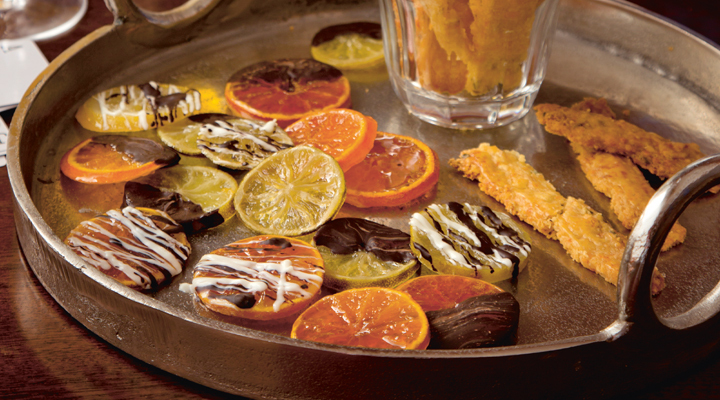 These jewelled zesty treats are ideal as a decoration on Christmas trifles or cakes. The slices will keep for up to five days, if they last that long! Leaving the peel on, cut the fruits into 1cm rounds. Bring the sugar and water to the boil in a large pot, stirring occasionally until the sugar dissolves. Add the fruit slices to the boiling syrup, then reduce the heat. Gently simmer for about 1 hour, until the slices are soft and glazed. Using a slotted spoon, transfer the slices to a wire rack set on a rimmed baking sheet. Let the fruit dry overnight or for at least 6 hours. Once dry, decorate the slices with melted chocolate and leave to set.